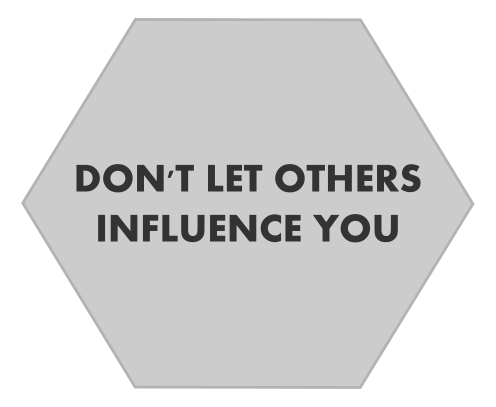 Don't Let Them Influence You. On the Saturday before Christmas, I went to the mall with my sister to meet some fellow 5SOS fans (WHOOT WHOOT). I'm going to be bluntly honest and I say it was the worst idea ever. I'll spare you the details of our downhill spiral, because that's not what this post is about. This post is about a conversation I had with one of the girls. Her name (for privacy purposes we'll say) was Allison and she was 13 years old. She was short and round and absolutely adorable. She didn't say much, and at first I thought maybe she doesn't like strangers - or perhaps she didn't like anyone at all. But we ended up in the back of the group, kind of trailing behind the other girls and listening to them talk about Micheal Clifford's hair and converse with strangers as they passed out flyers for the new LIVESOS album. I made a comment about being left behind which broke the ice. I connected with this girl in the most magnificent of ways. Why? Because of what she said. "If I said anything, people would hate me." As she said that I looked at the group of girls hobbling and chatting in front of us. I let my eyes linger on the big tree we all seemed to stop before and I replied with: "I know, right?" Our exchanges were short, full of teenage slang and clipped words. As I tried to break away from that, so that I could be eloquent and voice to her that her opinion mattered, it quite frankly came out like this: "So, I mean, screw other people because, who cares right? Well I care, so... yeah. Don't care." Thinking back I know I could've said something way prettier and like, ten times more inspiring, but it doesn't matter. Allison's words opened up my eyes and allowed me to see who she was. A blossoming teen girl scared to voice her opinion - and be herself. She reminded me of how I was at that age and how I am now. What I want you to take away from this is that 1). you are not alone. No matter what you're going through, no matter how hard, weird, or bizarre your situation is, someone else is going through the same thing. Someone out there understands. And 2). don't be afraid of what other people will do if you try to be yourself. In reality, we're all struggling with something. We all have to overcome something (or there wouldn't be any point to living life). So don't be scared. Don't hold back. Tug away your bindings, dear soul, and set yourself free. Be who you are meant to be because this world needs you to contribute, create and express. Are you afraid to be yourself? Why? This was so inspiring, Rose! As well as very true! Am I afraid to be myself? A few years back, I believe that I would have answered yes. I feel like my confidence was much lower then and because of that I would hide behind shyness, afraid to voice my opinion. As a child I don't think I was really ever afraid to be who I was but growing older it seemed like the fear crept in. People voiced their judgments, formed their friend groups and excluded the people they didn't like. I wouldn't say I'm afraid to be myself now either but at the same time as I go to a public high school it feels rather intimidating to voice my opinions and show who I am because a lot of people will instantly shut you down. I felt like I could relate to this, and a lot of people can. Sometimes I am afraid to be myself because I want to be the person that people like to be around. I've learned that it doesn't fulfill you and it's just better to be yourself so people will love you for who you are! I used to be afraid to be who I was... or rather, just FIND, who I was as a person. I constantly reflected other's likes, until I finally broke away and realized that I needed to be my own person. I'm certainly not afraid to be who I am now, but yes, at one point I was a pre-teen who wasn't able to be herself. Wow. This post was just perfect, Rose. I loved this Nicole Rose! So inspiring! I really love this post! Love your blog!